Forex.com review - Scam? Mobile? Demo account? Read more. Forex.com can proudly wear the crown of being the biggest and most popular forex broker in the United States, although they actually reach much further than that. Even in Europe, this broker is considered one of the leading forex and CFD brokers. The American market is one of the strictest in the world and CFD trading is completely banned. Because of this, brokers that want to cater to Europe and to the United States have to develop two separate products which we think Forex.com has excelled at. We have inspected Forex.com from both a European and an American perspective, and the following review sums up what we found. Forex.com is one of the biggest brokers in the world, and one of the chosen few to accept US-based clients. Being regulated on the US market is quite an achievement, as this is by far the strictest market in the world. Forex.com is also accepting EU based clients, and are fully regulated and licensed to operate in EU. They offer Forex trading, Stock trading, Commodities, Cryptocurrencies and other interesting stuff like equity indices and spot metals. If you are interested in trying this broker out, we suggest that you sign up with the 30 days free demo account. Any broker that has managed to receive a license from both the Commodities Futures Trading Commission (CFTC) in the United States and the Financial Conduct Authority (FCA) in the United Kingdom is 100% safe to use. These licenses are some of the strictest in the world, and it means that Forex.com is subject to regular audits and are forced to follow tough guidelines. To us, there is no doubt that Forex.com is a safe broker that can be used to trade forex and CFDs. Forex.com has a great and quite common range of platforms that cater to all kinds of traders with different levels of knowledge and experience. The main Forex.com trading platform is just called the Forex platform. It comes in one advanced desktop version that requires a download as well as a web-based version that can be used directly in your browser. In our opinion, the platform has everything you need from advanced charting tools to analytic indicators, trading signals, and incredible execution. In the United States, this platform only supports forex trading, but in Europe, it can also be used to trade CFDs. In addition, Forex.com also provides their customer access to the famous Metatrader 4 forex trading platform. The Metatrader 4 is one of ours and many other traders’ favorite forex platform, and we’re always pleased to see it available. With a Forex.com account, you get access to a downloaded version of the Metatrader 4 and the webtrader as well as a mobile version. Both the Forex.com platform and the Metatrader 4 comes in mobile versions. The trading apps can be downloaded to iOS and Android from the respective app stores, and they run smoothly on both smartphones and tablets. As always, the mobile trading apps are limited compared to the desktop version, but they do have all the features you need to study the market, analyze the underlying assets, and execute successful trades wherever you are. For a more detailed description of the two trading platforms, we suggest you check out Forex.com’s own platform comparison on the broker website. Since regulations for Europe and the United States are so different, Forex.com is forced to offer separate assets for the two markets. As an American trader, you can trade with 82 different currency pairs as well as gold and silver, however, as a European trader the range of assets is much broader. Naturally, there are differences between an American trading account and a European trading account since the markets look completely different. However, besides some unique business solutions, every trader has two account types to choose from. You can either open a real trading account that you use to trade with your own money. The registration process only takes a few minutes and you can start trading later today. The other option is that you open a Forex.com demo account and start trading using virtual money under real market conditions. Demo trading is completely risk-free and therefore an excellent way for beginners to get a taste of forex trading. Note that unlike many other brokers, the Forex.com demo account is time-limited and can only be used for 30 consecutive days. Over the years, Forex.com has acquired a few different licenses and authorizations from different organizations around the world. Out of these licenses, there are two that stand out as being especially important. In the United States, Forex.com is regulated by the Commodity Futures Trading Commission (CFTC) which happens to be one of the strictest regulatory bodies in the entire world. In Europe, Forex.com is regulated by the British Financial Conduct Authority (FCA) which also means that Forex.com operates under the European Securities and Market Authority (ESMA) regulatory guidelines. Funding and withdrawals to and from your Forex.com trading account is kept as simple as possible. In Europe, you can either use a debit or credit card or a regular wire transfer to fund your account. As an American trader, you have the same options plus the possibility of funding your account using a paper check. At the time of writing, no online payment providers could be used for transactions. However, the easiest way to get in contact with Forex.com is via their live chat. At first, when you open the chat you will be connected to a bot that can answer simple questions, but you can ask to be connected to a real person at any time. We have used the live chat on a few occasions and have always gotten quick and informative answers. On top of this, Forex.com also provides an extensive FAQ with a practical search function that lets you find answers to your questions in no time. 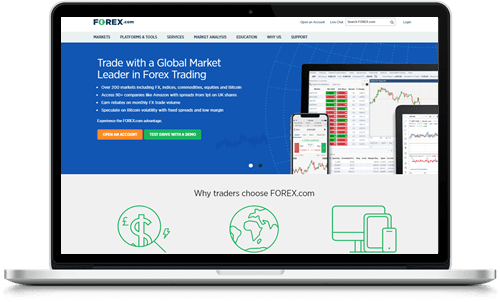 Forex.com is a great forex and CFD broker that is available globally through a well-designed and cutting-edge website and trading platform. The broker is owned and operated by Gain Capital which is a respectable financial firm that has been listed on the NYSE for the past few years. To us, Forex.com is extremely impressive especially since the broker provides not one but two different products – one for the American market and one for the European market. All in all, Forex.com is the perfect broker, especially for American traders. In fact, Forex.com has been the largest and leading forex broker in the United States for many years.